Welcome back to our second installment of the HJ News and Resource Roundup! Every week we will be posting the latest news and resources to keep you up-to-date on what’s happening in the struggle for health justice. This week, we’ll be discussing health reform, immigrant access to health care, the NYC hospital closures, and more. Wladyslaw Haniszewski, an undocumented immigrant who had lived in the United States for 30 years, was recently deported back to Poland–not by the US government, but by a hospital in New Jersey. Not wanting to cover the cost of Haniszewski’s care after he suffered a stroke, the hospital flew Haniszewski back to Poland without contacting the Polish consulate, arranging for his medical care once in Poland, or even waiting for him to regain consciousness. Eleven million undocumented immigrants in the United States are excluded from participation in the Affordable Care Act (ACA), but improving access to care for this population could benefit all Americans. Over 400 advocacy groups and organizations support immigrant inclusion in health care. North Central Bronx Hospital has closed its labor and delivery, nursery, and neonatal care units. Responsible for 1,500 births in the last year, NCBH was a critical health resource and many worry its closure will adversely impact the health of mothers and infants in the North Bronx, particularly within communities of color. Sign a petition to save NCBH’s labor and delivery services here! A judge has agreed to allow Interfaith Hospital in Brooklyn to remain open for 16 more days. Advocates hope the delay will allow them to stave off permanent closure of the bankrupt hospital, which serves some of central Brooklyn’s poorest residents. Many of its financial woes began with the slashing of the state Medicaid budget in 2009. Meanwhile, immunization clinics that provide free and low-cost services in the Bronx and Queens also face closure. You can sign a petition to keep them open here. The Texas Health Institute has released a report highlighting key provisions of the ACA that advance racial and ethnic health equity and protect the health care safety net. The report also identifies priority areas in ACA implementation going forward. Millions of Americans live in food deserts, a low-income area where there is limited access to grocery stores, making it expensive, difficult, and time-consuming to obtain fresh and nutritious food. Food deserts and food swamps–areas with a high number of junk food-peddling convenience stores and fast food chains in place of traditional grocery stores–are particularly prevalent in predominantly Black and Latino neighborhoods. Meet the women of color who are revolutionizing the approach to addressing health disparities, gentrification, and environmental degradation in their communities: through biking. Racial disparities in health care are considered the new frontier for civil rights. As popular discourse on racial health disparities typically focuses on Black and Latino populations, other marginalized communities–such as Native Americans–are often overlooked. Yet a large minority of Native Americans live on reservations in rural areas with limited access to quality health care, leading to disproportionately high negative health outcomes. Conservatives both on the state and national levels are still working to block the implementation of the ACA. 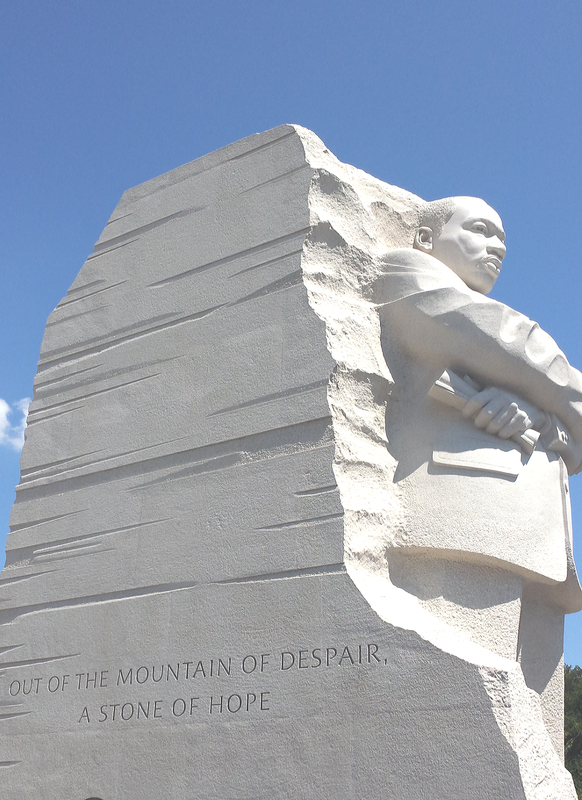 This week was the 50th anniversary of Dr. Martin Luther King, Jr.’s “I Have a Dream” speech at the March on Washington. Check out his speech, accompanied by beautiful animation, here. Our own HJ team member Jenn Swayne reflected on the anniversary of this pivotal moment in history–and where we have left to go as a nation–here. Today marks the 50th Anniversary of the 1963 March on Washington. This March took place during a time of great upheaval and racial tension and represented a growing swell of actions highlighting the injustices that permeated American society. Marchers traveled from near and far to call for equality in civil, political, economic, and human rights. On this anniversary, individuals are once again convening on the Washington Mall. This time, the purpose is to not only commemorate the historical March of 1963, but to also take stock of where we have yet to go as a nation. Today, we no longer face water hoses, attacks by police dogs, “whites only” signs, and literacy and jelly bean tests for voting. Instead, we face systemic inequality. Instead of “whites only” signs, we continue to face the pervasive notion that people of color do not belong in certain spaces, as evidenced by the murder of Trayvon Martin, or that they pose a threat, as demonstrated by the illegal use of “stop and frisk.” Instead of jelly bean tests that disenfranchise black voters, Justice Antonin Scalia labeled the Voting Rights Act a “racial entitlement” before the Supreme Court obliterated the Act. The healthcare setting is another sphere where systemic inequality remains. Low-income communities of color face unequal access to healthcare and bear a disproportionate burden of poor health outcomes. One example is the continued loss of healthcare services in medically underserved neighborhoods. In New York City, we are in the midst of a crisis where institutions such as Interfaith Medical Center in Brooklyn, Holliswood Hospital in Queens, and two Immunization Clinics in the Bronx and Queens will be closed. The barriers to healthcare that medically underserved communities face fit hand in hand with the other forms of inequality mentioned above—they reflect a perverse disregard for people of color and low-income communities and demonstrate that we still have much further to go to realize the dream of full equality. Introducing the HJ News Roundup! Every week we will be posting the latest news and resources to keep you up-to-date on what’s happening in the struggle for health justice. Let us know what you think! Readers in NYC are probably aware of the deteriorating health care crisis in Brooklyn as Long Island College Hospital (LICH) and Interfaith Medical Center face closure. A recent court order will allow LICH to continue operating temporarily. And while Brooklyn hospitals are struggling to stay open, the crisis has now spread to the Bronx where the city has decided to close down Labor and Delivery at North Central Bronx Hospital. This may be a first step towards closing down the entire facility. Congress is preparing to head back to Washington, D.C. and will resume attempts to pass a comprehensive immigration reform bill. Here’s some timely analysis of immigrant access to health care under the Affordable Care Act (ACA) and current immigration reform proposals. Chicago activists declared a major victory earlier this month after fourteen undocumented immigrants in Chicago Hospitals were able to gain access to organ-transplant lists. An article from Fronteras illustrates the specific challenges that mixed status families face in accessing vital health services. A new report contains state estimates of the number of low-income immigrants that would not qualify for Medicaid coverage under the ACA’s expansion. Another report looks at health coverage among undocumented immigrants. This month, the HJ team celebrated a major civil rights victory after Nassau County signed an executive order ensuring language access for its limited-English proficient (LEP) residents in their interactions with county agencies. Finally, in California, legislators are considering a bill that would expand the number of medical interpreters. The bill (AB 1263) was passed by the Assembly in May and the Senate is expected to vote on it this fall.